With rapid deployment at the forefront of its design, the Angus Hi-Combat Responder 140 is a fully self-contained mobile foam monitor unit, which has been specifically developed for a fast response by a single person to fight fires. The unit has excellent handling and mobility as a result of the low centre of gravity and features solid rubber tyres to enable movement over difficult terrain. The usability of the Angus Responder 140 is further enhanced by the addition of screw shaft prop outriggers which provide stability when the monitor is in action. 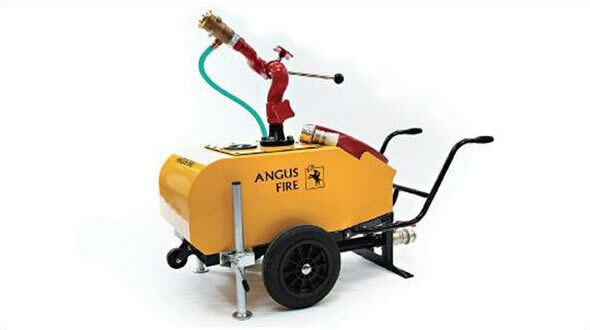 To operate simply connect the Angus Duraline fire hose which is supplied with the unit to a suitable water supply, open the valve and allow the water to flow to the monitor. Foam is induced automatically by opening the foam valve. The unit can be used for cooling-water only, or fire fighting with foam. The standard unit comprises of a 140 litre foam concentrate tank, and Angus 605 bronze industrial monitor and an Angus Hi-Combat 883 bronze nozzle. Also included is a 15m length of Dutch coiled 45mm diameter Duraline fire hose fitted with 2.5” instantaneous couplings (other connections available to special order). Two ball valves are also fitted, one on the water inlet and one on the foam induction line. 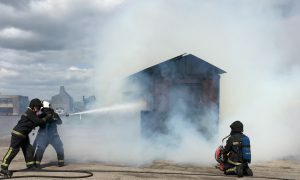 The Angus Hi-Combat Responder 140 is idea for the protection of oil storage and loading terminals, small airfields, industrial sites and similar high risk areas.